The late Pro Hart was considered to be one of Australia’s greatest artists. Prior to his passing from Motor Neurone Disease in 2006, Pro had lived a life full of expression which was clearly visible in every painting he created. His unique ability to express the spirit of the Australian story in every scene he created, greatly appealed to the everyday person. 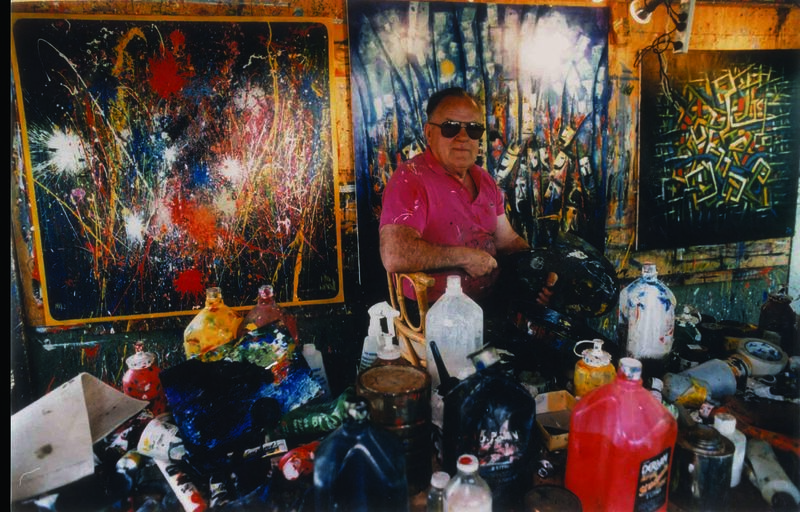 He was always surrounded by chaos but out of it came incredible creativeness. Many people would remember Pro from the famous carpet commercials he appeared in on TV; Oh! Mr Hart… what a mess! Became a catch phrase in the 90’s that is still quoted today (was even quoted by the Prime Minister recently)! Many of his friends would also remember him as a larrikin who liked to have a good laugh. For the art dealers and agents he supplied, he would be remembered as a highly saleable moneymaker for their galleries. However by charities around the country, Pro Hart would be remembered for his incredible generosity. To me, he was just dad and one of the most genuine and down to earth people you could ever hope to meet. Even to this day, Pro Hart paintings are still highly sought after as prized additions to significant private and cooperate art collections. Sadly there are some unscrupulous people out there, still trying to take advantage of Pro’s reputation by attempting to produce forgeries of his work. Even in recent weeks a gentleman who was in China recently, told me where he saw Pro Hart paintings being copied with such precision that (to the untrained eye) it was almost impossible to distinguish between forgery and original. Recently, I was also contacted by a lady who was very disappointed to discover that a painting she had just purchased at an Australian auction house may have been a forgery after she came across an exact image of her painting for sale through a completely different auction house. Closer inspection of online photos revealed this was in fact the exact same image sold a month a part by different auction houses, in a different frame, and painted on different canvas board to her painting. David Hart Galleries has been valuing and selling Pro Hart original artworks for almost 30 years and is the “only” authorised agent to sell Pro Hart’s work in Australia. David Hart Galleries has the largest range of Pro Hart artworks available to purchase anywhere. Some of them directly sourced from the Pro Hart Estate and many other quality resales which have been hung and loved by many Australian families who are either downsizing or in need of funds. We absolutely guarantee the authenticity of every work we have for sale and will deliver it for free anywhere in Australia. If you receive a Pro Hart painting from us and you don’t love it when it arrives, you can return it to us for a full refund. Now that’s what I call peace of mind! Why would you buy your Hart from anywhere else, buy direct from the family!